In the days that followed May 23, when a thousand Jewish Israelis swarmed through the streets of Tel Aviv, attacking any dark-skinned person they found, international media outlets sent representatives to the south of the city, trying to make sense of the anti-African race riots. But after a week of intense coverage, the plight of non-Jewish African asylum-seekers fell from the headlines. In the five months since, the mainstream media has paid only scant attention, if any, to the Israeli government's response to those race riots. For months, the Israeli army has been covertly operating in the Sinai Peninsula, in sovereign Egyptian territory, to prevent non-Jewish Africans from reaching the border with Israel and requesting asylum. Responding to queries, the army uses purposefully vague language to describe its border activities, neither admitting to these cross-border raids, nor denying them. However, individual Israeli soldiers have given anonymous testimony confirming the army's activities on Egyptian soil. Egypt Independent reports that one of these reservists described in an affidavit how the Israeli army deceives the African asylum-seekers by pretending that they have already reached sovereign Israeli territory. "...we give them the illusion that they have arrived to the territory of Israel by not using aggressive behavior, displays of tension, or threats with our weapons. They suggested that we receive those that come with the blessing 'Welcome to Israel,' to act friendly, to ask the purpose for their arrival, to offer food and water and to promise them that a bus will arrive soon to take them." In the Jerusalem Post, Ben Hartman interviewed another of these soldiers, writing: "David said that even when the migrants are stopped inside Egypt, the IDF will often have to bring them into Israel to drive them to where they turn them over to the Egyptian police." It emerges from these reports that Israel coordinates with Egypt to enter its sovereign territory, takes non-Jewish Africans asylum-seekers either by deception or force or both, brings them into sovereign Israeli territory, and transports them along an Israeli road to an official border crossing, where it hands them over to Egyptian authorities, from whence they are taken to an Egyptian jail. As Israel continued to build a fence on the length of its border with Egypt on order to prevent non-Jewish Africans from crossing into Israeli territory and requesting asylum, Africans began to camp in front of the desert fence, hoping that Israel would take pity on them and allow them in. In early September, a group of 21 African asylum-seekers reached the Israeli border fence but were not allowed to enter the country. The Israeli army was ordered to give the group "as little water as possible". One of the women in the group suffered a miscarriage at this time. Upon learning that the Africans' basic needs were not being met, a group of health care workers from the group Physicians of Human Rights traveled to the border area. The Israeli army prevented the group from reaching the asylum-seekers and refused to pass on to them any food or water. Yossi Gurvitz reported for 972 Magazine that the Israeli army's "as little water as possible" consisted of exactly two loaves of bread in total and 4.5 liters of water per day for 21 people - the equivalent of 214 milliliters of water per day, fewer than the contents of a can of cola. Israel eventually agreed to allow two women and a teenager into the country. Days later it emerged that the army tried to drive the remaining 18 African asylum-seekers away by poking a metal rod at them and by shooting gas at them. After eight days of nearly no food or water, Israeli soldiers grabbed the Africans and physically forced them into Egyptian territory. "International law is crystal clear: no summary rejection of asylum seekers at the frontier and no forcible return unless and until it is established that their refugee claims are not valid." Revelations that Israel provided non-Jewish Africans requesting asylum at its border with "as little water as possible" did some public relations damage, as many Israelis like to think that they are their country are responsible for acts of charity. Within weeks, Israel went on a media offensive to redeem its reputation and absolve it of any responsibility to treat asylum-seekers in a humane way. Two weeks later, an Israeli soldier was shot and killed by a group of militant of unknown non-African national origin as he was patrolling the Egyptian border. An army spokesman told the media that the shooting occurred when the soldiers went to offer water to a group of non-Jewish Africans camped at the border. Israel Deputy Prime Minister and Interior Minister Eil Yishai immediately proclaimed that IDF soldiers should have zero contact with asylum-seekers at its border, blaming them for the death of the soldier. However, Colonel Guy Biton, the commander of the actual army brigade that was attacked flatly denied this causality, saying an army investigation determined "that there is no connection between the presence of the infiltrators at the border and the incident with the terrorists". Of the 60,000 or so non-Jewish Africans that managed to make it into Israel before authorities began incarcerating all asylum-seekers entering its territory in recent months, most are not permitted to work. As a result, many of them are living miserable lives of appalling deprivation. The Eritreans, who account for more than half of the non-Jewish African asylum-seekers in Israel, are pressed even harder to survive because representatives of the Eritrean dictatorship that they fled, working out of the country's consulate in Tel Aviv, regularly extract money from them. The Israeli authorities make no effort to halt this practice. Most recently, at its last session before dissolving itself in anticipation of upcoming national elections, the Knesset Internal Affairs and Environment Committee found time to advance a bill that would make it illegal for African asylum-seekers to send their earnings out of the country, and even strip them of their savings when they leave the country. The legal rights of the non-Jewish African asylum-seekers are steadily being eclipsed by Israeli authorities. In an article in 972 Magazine, solidarity activist Elizabeth Tsurkov explains how simply accusing an African asylum-seeker of a crime is now sufficient grounds for the state to put them behind bars indefinitely. This provides an obvious incentive for Israelis to fabricate false charges against African asylum-seekers. 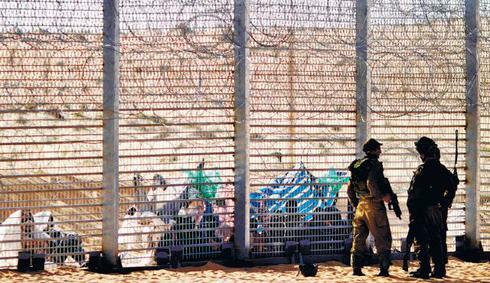 Until recently, non-Jewish African asylum-seekers who did manage to cross the border into Israel were held for a few weeks, examined to ensure that they didn't carry any communicable diseases, and eventually released into the Israeli population. Since the anti-African riots, these new asylum-seekers have been automatically incarcerated. Before being jailed in Israel, many of these African women were kidnapped, tortured and repeatedly raped, sometimes for months on end, by gangs of human traffickers in Egypt. Even under Israeli law, these women are supposed to be released from incarceration and offered treatment at first opportunity. Instead the authorities keep them under lock and key. Israeli authorities have even refused to staff the detention facility with an on-staff woman's health doctor, dismissing the repeated pleas of migrant rights groups. Days ago, a pregnant African woman incarcerated there who was denied appropriate medical treatment gave birth to a stillborn baby. Incarcerated African asylum-seekers can now expect to be stranded behind bars, denied the right to receive visitors, even if these are lawyers. The Hotline for Migrant Workers, a human rights organization, petitioned Israel's High Court of Justice in August, demanding that Prison Services end its practice of banning visits for asylum-seekers. This past month, hundreds of asylum-seekers from Eritrea imprisoned by Israel held a hunger strike when they learned that under a new law the Israeli Knesset passed in January, they would remain incarcerated for at least the next three years. Israel has not permitted direct contact with the Eritreans who undertook the hunger strike, but one of them told independent journalist Sharon Livne by phone that the women who organized the strike were taken away to another jail, which Israeli prison authorities would not divulge the name of. To those who escaped the brutal dictatorship in Eritrea, an "unnamed" jail means a torture dungeon. Fearing such a prospect, the rest of the asylum-seekers ended their hunger strike. Two weeks ago, Israel's national planning and construction council approved the Defense Ministry's plan to construct another internment camp to hold non-Jewish African asylum-seekers. The council dismissed the objections of the Social Affairs Ministry, which argued that the plan would pack 20 people into each structures fit for only 6. Interior Minister Yishai, the ranking government official that decides who may stay in the country and who must leave, announced at the end of August that beginning October 15, all Sudanese asylum-seekers would be rounded up into internment camps and Eritrean asylum-seekers would soon follow. Together, these account for about 90% of all African asylum-seekers in Israel. Human rights groups appealed to the Israeli judiciary to halt the round up. The October 15 deadline came and went, but not because the courts had instructed the government not to carry it out. Rather, from the court proceedings it emerged that the official order to round up the African asylum-seekers had not yet been given. An senior Interior Ministry official explained to the Jerusalem Post that this order would be forthcoming as soon as construction of the internment facilities is complete, warning that it would only be a matter of a few more weeks. It's possible to get a sense of the fear that pervades the non-Jewish African communities in Israel by reading the statements of those amongst them who have the most privilege: African diplomats. In August, the ambassadors of Angola, Ethiopia, Ghana, Ivory Coast, Kenya and Nigeria complained to the government that they feared for their own safety and for the safety of their families when walking down the street in Israel. It's possible to get a sense of the depth of the Israeli hatred for foreigners by reading the comments in Hebrew on any internet article about non-Jewish African people. As one example, Ido Kenan recorded the comments made on the official Facebook page of the Israeli police in response to a post informing the public about a 5-year-old African girl that had gone missing. Responses included expressed hope that the girl would not be found and the statement that it would not be so bad if the child was raped. Further insight into the sheer visceral hatred that non-Jewish Africans are exposed to on a daily basis in Israel is provided by the English-subtitled interview I conducted with Dr. Rami Gudovitch, a Jewish Israeli man who lives and volunteers in south Tel Aviv with disadvantaged communities, especially African asylum seekers. "It's perfectly legitimate in Tel Aviv to swear at a black person in any way imaginable. Not just any kind of swear words, but horrible sexual things, to children... They throw feces, but the big joke is to throw feces not at children but at women with babies... It's normalized to wish death to these people, to wish death to little children." In a September article for Open Democracy called "Israel's Race to the Top", I analyzed some of the causes of this base hatred. There I argue that a significant portion of the anti-African sentiment in Israeli society is the result of forces intolerant of endogamy, or out-marriage. "They speak perfect Hebrew because they are Israeli in every way, in the way they dress, in their mentality, in the slang they use, in everything. They learn all day with Israeli Jews. They hang out with them on the weekends... it's the first waves of young couples, of Eritrean women and Jewish Israeli men, and the opposite. And with children that have been born to them. You see them with your own eyes. As far as I'm concerned we should take it to the police." According to Israeli law, foreign nationals in romantic partnerships with Israeli citizens may apply for residency status in the country, and ultimately, for citizenship. The day after I finished writing the above article, Israeli Army Radio reported that Israeli authorities would not permit African asylum-seekers to stay in the country, even if they started a family with an Israeli citizen. While a vast majority of Israelis continue to support all of the government's punitive policies concerning non-Jewish Africans, there are some voices in the Jewish community that continue to plead the case of the asylum-seekers. "We - HIAS, the United Nations High Commissioner for Refugees and the U.S. Department of Homeland Security - trained Israeli officers to the highest international standards," he said. "But the system is basically carved out to reject claims. The state is doing just about everything it can to not implement the spirit of the Geneva Convention." To be sure, there are Jewish American voices that decry Israel's treatment of Africans. In Newsweek's forum on Israel and Palestine, Open Zion, Emily Hauser wrote in September, "This is a level of inhumanity that frankly boggles my mind & makes me ill... To the extent that we in America don't call our Israeli brothers & sisters on this inhumanity, we're complicit in it." "But what this whole African issue really underscores is just how problematic Israel�s strict ethnic definition of a 'Jewish state' is: to remain in control of their own affairs, Israel will have to effectively get in the business of ethnic cleansing." "If you do only one thing for Israel this year, let it be this: Send a message... Write your member of Congress, senators, or members of parliament... Tell them that creating what amounts to a concentration camp for refugees would be a moral catastrophe for Israel." But efforts to spur Jewish Americans to speak out against Israel's harsh treatment of non-Jewish Africans have gone unheeded. Jewish Americans, even those who take an active interest in Israeli affairs, remain wholly ignorant about the extent of the problem and Israel's attitude towards asylum seekers. At the Israeli Presidential Conference Facing Tomorrow in June, an annual gathering of Jewish leaders from around the world, I conducted an informal survey of attendees, asking them how many non-Jewish refugees Israel has accepted since 1948. A large majority of the responses were in excess of the correct number - less than 200 - by several orders of magnitude. Jewish American organizations issued one-off condemnations of the May 23 anti-African race riots in texts filled with praise for Prime Minister Netanyahu, who has repeatedly characterized the mere presence of non-Jewish Africans as a threat to the state, making him the most senior official bearing responsibility for the vigilante attacks. Documentarian Daniel Sieradski assembled these press releases, comparing and contrasting them with the political positions taken by these same Jewish American groups on the issue of Mexican migration to the United States. The discrepancy between these two sets of statements reveals the glaring hypocrisy of these groups. Since May, mainstream Jewish American organizations have not publicly commented on any of the actions that Israel has taken towards non-Jewish African asylum seekers. Their silence can only be understood as tacit support for Israel's plan of "ethnic cleansing" the country of non-Jewish African asylum-seekers by rounding them into a "concentration camp". On October 14, I filmed a group of Africans from Sudan in Tel Aviv, protesting Israel's announced plan to round them up and force them into an internment camp. After the Sudanese rally, on October October 18, I filmed a group of Africans from Eritrea in Tel Aviv, protesting Israel's plan to apprehend and incarcerate them and its punitive policies towards non-Jewish African asylum-seekers. Likewise, neighborhood committees advocating for the immediate expulsion of all non-Jewish African asylum-seekers have returned to the streets. At a rally earlier this week in front of government buildings in Tel Aviv, I filmed one speaker insisting that the people must not wait for the Israeli High Court to authorize an expulsion, but rather that they must carry it out themselves. This month an official Israeli Knesset Research and Information Center report was made public, though it was authored just days after the May 23 anti-African riot in Tel Aviv. In it, Dr. Gilad Nathan presents facts and figures about non-Jewish African asylum-seekers in Israel and around the world, comparing and contrasting them. The 30-page document, which Megafon's Sharon Livne summarizes, notes that Israel is the only country in the Organization for Economic Co-operation and Development that uses "group protection" status to avoid having to examine individual requests for refugee status. It establishes that a vast majority of asylum requests by Sudanese and Ertireans are accepted all over the world. It establishes that a vast majority of asylum-seekers end up in developing countries, and that the number of asylum-seekers who have arrived in Israel is small compared to other developed countries, even in proportion to its population. And it establishes that Israel's financial contribution to UN refugee resettlement programs is infinitesimal compared to other developed countries. All of these facts were previously known to human rights groups, but now they have been accepted as documentary fact in an official Israeli parliamentary report. The report's publication, however, has not altered the government's hostile orientation towards non-Jewish African asylum-seekers by one iota. With a national election campaign in full swing, a number of politicians, including Prime Minister Netanyahu, are now bragging to the media about all they have done to remove non-Jewish African asylum-seekers from the public space. Other politicians are attacking the government for not doing enough in this regard, demanding that it take more brutal measures, dragging the debate even further to the right. It is unclear how far Israel is willing to go in order to purge itself of its non-Jewish African population, but the campaign has already exacted blood. Over the summer, Israel deported approximately 3,000 African asylum-seekers to South Sudan, over protests that the situation there was still unsafe. Dimi Reider writes for 972 Magazine that within a week of their deportation, children of the asylum-seekers began to die of diseases that are perfectly treatable in Israel.